If you want an antidote to the usual long-winded slot titles, how’s this for size? The Zoom slot is an unusual-looking yet very appealing slot game with a simplicity of design that works really well. If you’re ready to play Thunderkick slots – that’s the software creator responsible for Zoom – now’s your chance. 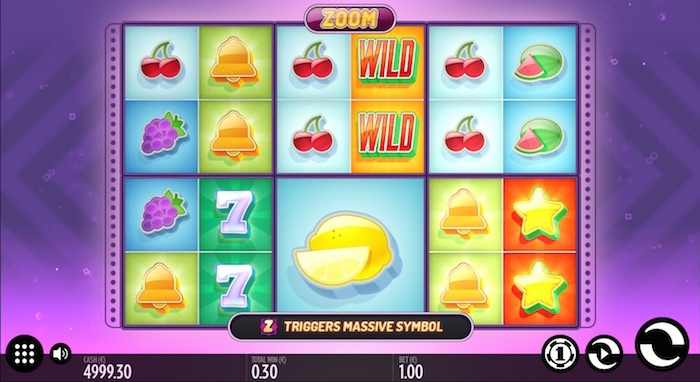 The Zoom online slot from Thunderkick is a 6×4 slot game with 64 paylines. It features six ‘Zoom areas’ (more about those shortly), each of which has four single symbols in it. We say single, because there is an opportunity to get bigger symbols as well. If the Zoom symbol is present in four Zoom areas forming a square, a Super Massive Symbol will emerge! Zoom is a powerful classic slot. The game has a very simple style, using a variety of classic fruit machine symbols to pepper the reels with. As such, it has a classic fruit machine feel mixed with a very modern slot game. Mixes like this one don’t always work, but that’s not the case here. Don’t be put off if you were expecting a ‘normal’ slot game. You get comprehensive instructions with this one and you can also give it a spin in demo mode first. This should make everything much clearer… along with our review, of course. You get fairly simple yet very sharp graphics when you play the Zoom slot. The background is kept very simple in shades of purple and pink, which focuses your attention on the game itself. You’ll notice that the six reels really don’t look like reels at all. Instead, they’re flat, but they spin very smoothly with each go. The grid remains overlaid on the screen as you spin, but it’s what appears in each one that can determine what happens next. See that little symbol on the left with nine dots? Click on that and you will see a trophy and a page with writing on it (or an idea of one, anyway). The trophy reveals the pay table, while the page reveals the rules. There are four types of fruit, a 7, a bell and a gold star here. The latter is the most rewarding of all for three or more. You will also see a wild symbol – the word in red over an orange background, with some green trim for good measure – and a scatter. The scatter is the Zoom symbol for the game. it’s basically a large gold Z on a purple background, and it’s the most valuable symbol of the lot. If you’ve been paying attention, you’ll know we mentioned the prospect of massive symbols appearing in this game. This is the most important part of the entire game, and it has the power to affect your payouts too. As you spin the reels, watch and see if you get a Zoom symbol. If you do, the reels will stop spinning to end that go, and the Zoom symbol will expand to become a Massive Symbol. This basically means it takes up a 2×2 position on the reels, instead of taking up just one space. When it has expanded, all six reels will spin again as a free re-spin. The only difference is, the four spaces taken up by the Massive Symbol will spin together at the same size. Now when the free spin ends, whatever symbol lands in that Massive Symbol space will be a Massive Symbol. Sounds obvious, we know, but it could be any symbol at this point. That means you will be increasing your odds of getting one or more winning combinations with the help of the new Massive Symbol. It’s worth bearing in mind that whenever a Zoom symbol appears, it will change the four symbols in the relevant Zoom area into a Massive Symbol. But it gets better still. There is also an opportunity, if you’re really lucky, to get a Super Massive Symbol. For this to happen, you need four Zoom symbols to appear in the same spin. Moreover, you need one Zoom symbol in each of four Zoom areas, and those four areas have to form a square. There’s a good illustration of this in the pay table, so do take a look. This means you could end up with 16 squares all covered by one single symbol. You can imagine just how thrilling that could be when it comes to calculating your prizes! When you click on the casino chip near the bottom right, you’ll open up your bet options. The smallest bet on an individual spin is 10p, and the biggest is £100. There are 14 bet options to choose from. The return-to-player, as mentioned in the instructions for the game, is 96.2%. You also stand a chance of winning up to 1,500x your bet if you get really lucky. There are however plenty of other winning chances as well. 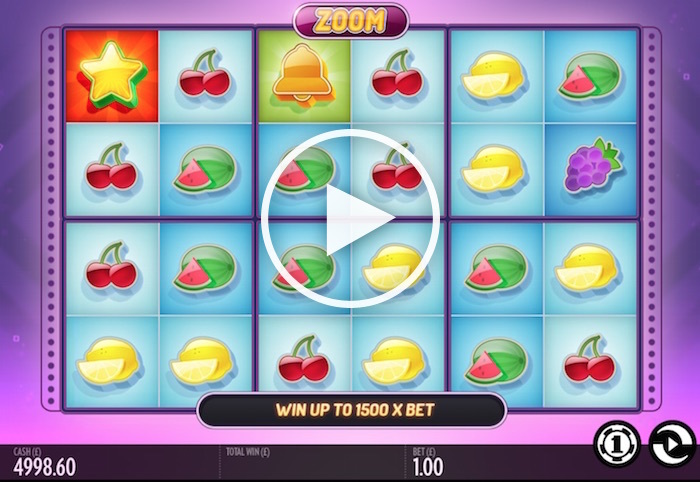 If you’re looking for something very unlike your traditional slot game, the Zoom slot has plenty to offer. You may never have tried Thunderkick online slots before, but this would be the perfect introduction to this particular provider. True, there isn’t a bonus game here, but you do get some re-spins from time to time and let’s face it, those large symbols are what we’re all going to be playing for, aren’t they?